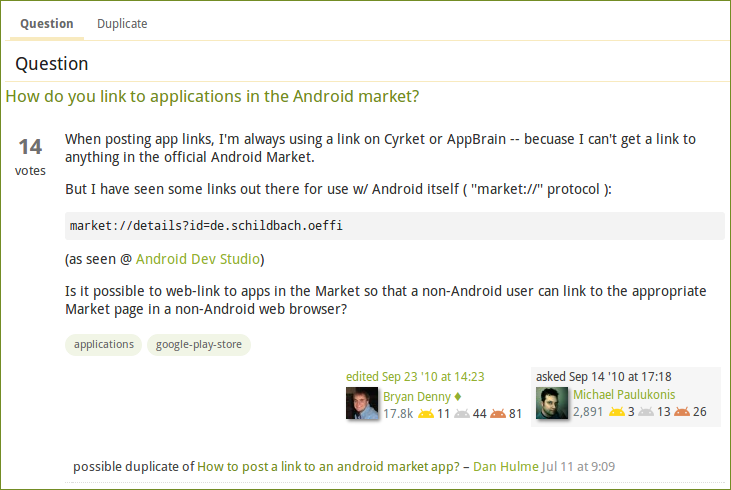 The question "How do you link to applications in the Android market?" 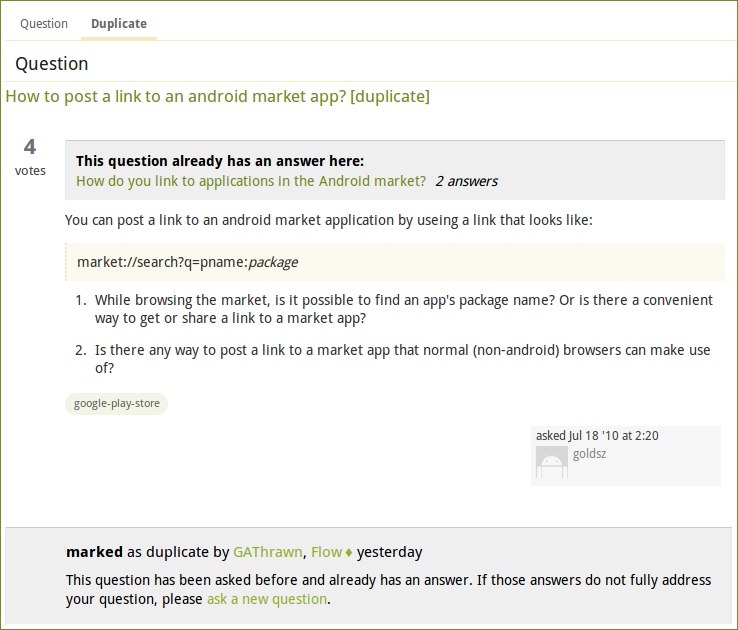 is being marked as duplicate of the closed question "How to post a link to an android market app? [duplicate]", that in turn mentions the first one as duplicate, causing an infinite cycle. This appears to happen more often that it should and I am not sure of what's the appropriated action to take with this scenario. Should this questions be flagged as to report the issue or should one just skip this subject on the review for close votes (assuming that there's already a method to deal with this...) ? Placing a comment on the question that is going to cause a dup cycle is the right thing to do. Hopefully users working on the review queue will notice the comment and choose the right action (e.g. Leave Open). I also just noticed that the system prevents duplicate cycles (not sure if only direct cycles or also deeper ones). If the cycle has already been established, the you should flag for mod attention and/or cast reopen votes. This is quite possibly my fault (though the system should probably handle it better). At the end of last week How do you link to applications in the Android market? came up in my Close Votes queue as a dupe of How to post a link to an android market app? but after looking at the two questions, it was obvious that one had old, out-of-date and (now-)incorrect answers (one answer was by me) whereas the other one had answers that are current and correct. In my opinion the Close As Dupe vote had been cast on the wrong question (based on which one had the currently good answers) so I "Leave Open" voted the one and I submitted the first VtC on the other. Having explained what I did though, the system really should show what's going on in a clearer manner, and handle the situation where one is Closed as a Dupe while the other is still in the vote to close phase.